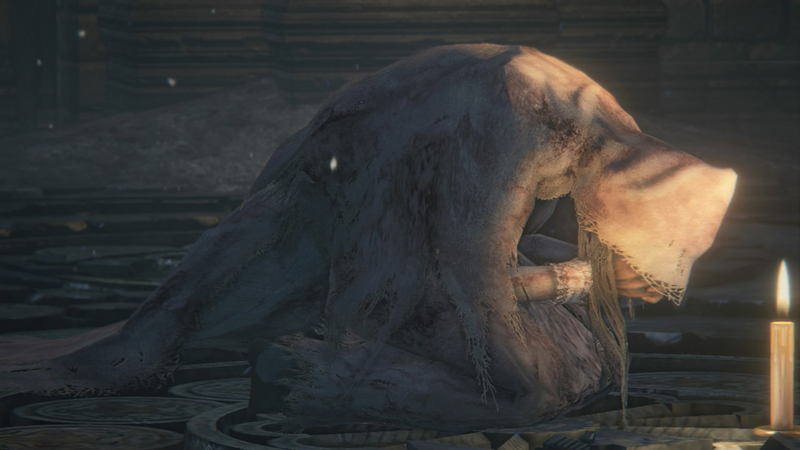 Bloodborne’s fourth boss is not really a vicar. Bloodborne has a real best theme going on, so if you expected Amelia not to have four legs and anger management issues, well – surprise! Taking her down rewards you with the Gold Pendant. This is one of the easier boss fights, because Amelia has one major weakness: all her attacks are frontal. Oh, she hits, and hits hard – but as long as you’re not in front of her, you’re laughing. Staying out of that zone is your priority. In the first phase of the battle, the Vicar tends to use sweeping attacks and grabs, neither of which will hit you if you’re too one side. She does have a longer range attack, sending a shockwave out of a ground pound, and she does one of those leap attacks, too. Luckily, she won’t do either of these if – you guess it – you’re standing to one side of her. Just consider your role in this battle to stare in fascination at her left hip. Sometimes she will suddenly turn around, but you know where the dodge button is by now. Try to keep a little bit of stamina on hand in case of this event. In addition to having a smack at her after each attack, Amelia gives you a great opportunity to damage her when she holds her talisman and begins glowing. Get right behind her and wail away with no holds barred, she does an area of effect attack that hits everywhere but behind her. No nasty surprises in this battle. When the good Vicar is down check out the pedestal for a cutscene, then activate the Grand Cathedral lantern. Now we’re off to Hemwick Charnel Lane to fight the Witch of Hemwick.